That’s right. They’re finding the ultimate cure for zits, the perpetual scourge of teenagers everywhere. Who are ‘they’? A rare alliance between a university lab and a major player in big medicine. These are international vaccine purveyors Senofi-Pasteur and the University of California. The picture above? 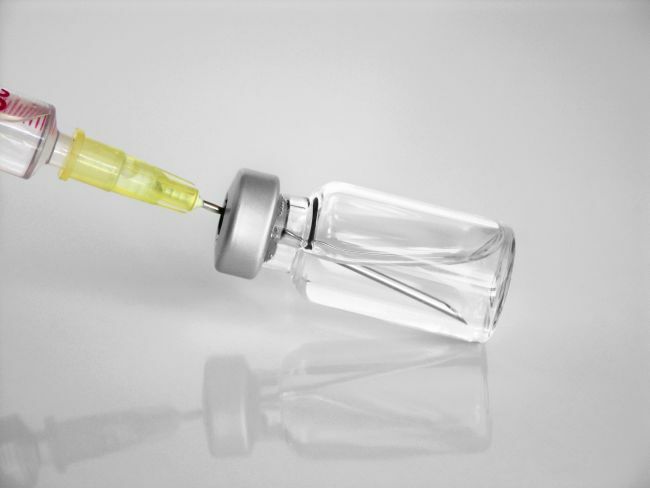 Random stock photo of a vaccine. It’s either this or a pimply faced kid, which is awful. The trick is to harness antibodies that literally kill the bacteria responsible for acne, which is considered a full-fledged ailment that affects millions of people. In 2008 they reported that mice given simple nasal-spray vaccines containing whole, dead P. acnes, or a protein from its surface, showed reduced ear inflammation compared to unvaccinated mice when they were then given a live bacterial injection. What does it mean? The scientists are using dead acne bacteria to protect the afflicted skin. Well, not a person’s skin but their current test subjects, mice. Of course, at its present stage it’s unknown if this ‘vaccine’ is ever going to be widely distributed. Let’s just hope a viable solution is eventually found. Even just reducing the ravages of pimples is an achievement in itself.